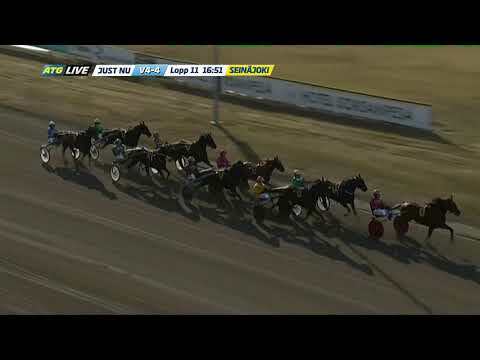 The famous Seinajoki harness race took place today in Finland, raced over 2100 meters autostart, seven starters) and 11.3/1 Atupem (6, Andover Hall-Rudy Rose) scored timed in 1.11.8kr with a strong late rally from the back, engineered by pilot Santtu Raitala. First prize was 70,000€ to the Finland-bred winner. Pastor Bob was a close second with Johan Untersteiner up. Chief Orlando held third for driver Antti Teivainen. Trendy OK was a game fourth after racing first over for Alessandro Gocciadoro and On Track Piraten was fifth with Hans R. Stromberg driving. Dreammoko was sixth for Win Paal. The race time was anew race record, lowering the 1.12.1kr mark set in 2016 by El Mago Pellini then handled by Adrian Kolgjini. Earlier in the day at Umaker (SWE), the UM Fastfigheter V75 Gold went to 1.3/1 Propulsion (8m Muscle Hill-Danae-Andover Hall) reined by Orjan Kihlstrom to the 1.11.3kr timed victory. Propulsion recorded his 37th career win in 67 starts now for 23,439,062SEK earned. 3.9/1 Muscle Hustle (6m Muscle Mass- Crown Laurel-Cantab Hall) was second for Robert Bergh, ahead of 56.9/1 Eder Bob (8m Crazed) reined by Rickard N. Skoglund.